MARYKA BIAGGIO is a former psychology professor turned novelist, with a passion for historical fiction. "This double-stranded narrative bounces back and forth between the extortion trial of turn-of-the-century con artist May Dugas and the international escapades that led to her arrest. Basing her novel loosely on a real-life figure, the woman the venerable Pinkerton Agency once dubbed the “Most Dangerous Woman,” Biaggio re-creates the deliciously fabulous foibles and follies of a woman born into hardscrabble circumstances but determined to make her way in the world with wit, beauty, and a brazen ability to exploit her feminine charms for a very high price. Whether one admires or reviles May, theres no doubt that she [Biaggio] makes the most of every entertaining opportunity—and, hey, a girl’s gotta make a living, especially with a particularly persistent Pinkerton detective hot on her heels. Sheer, frenetic fun." 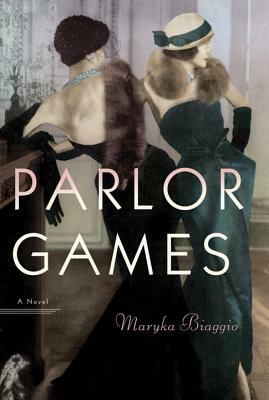 "Parlor Games is a captivating tale narrated by the irresistible and deliciously unreliable con-woman, May Dugas. Her escapades, which span the Gilded Age right through the turn-of-the-century, immediately transport the reader to a bygone era. It's a wildly entertaining and constantly surprising ride." In the first paragraph May says, “You and I, my new friend, will become well acquainted over the course of this tale.” This suggests something more than the reader simply becoming acquainted with May. Why might the narrator address the reader like this in the opening chapter? At the end of the first chapter May explains, “I will tell you my story—all of it—and truthfully, as I’ve never been able to tell anyone before.” Is she unerringly honest in recounting her story? What evidence is there of this one way or the other? What does this say about her stance toward the reader and her account of her story? Does May provide a balanced account of the 1917 trial? What suggests that she does or does not? What do Frank’s letters imply about the nature of the relationship between her and May? Can we trust Frank’s portrayal of her relationship with May? In what ways is Frank’s perspective on the trial different from May’s? What do the differences in their views tell us about May? What kind of influence did May’s parents have on her? How would you characterize her father? Her mother? How important were her brothers to her? Do you believe May loved any of the men she met during her travels? Did she ever find true love? What does the yellow diamond necklace symbolize to May? What does it mean to you? At one point the yellow diamond necklace goes missing. Do you think May knew of its whereabouts? Early on May refers to Pinkerton Detective Reed Dougherty as “the burr in my boot.” According to her telling he is intruding on affairs he has no right to meddle in. Were his charges of blackmail, spying, and extortion justified, or was he, as May contends, interfering in personal matters outside the province of the law? What might have motivated May to marry the Baron? Did the marriage start on firm footing or was it doomed to fail? When speaking with Basil Zaharoff, May says, “I’ve never been able to determine what separates danger from adventure.” Is May a thrill seeker? Does she thrive on adventure? Can you think of instances in which she flirts with danger? To what extent do you believe May’s actions were motivated by a desire to serve her family? And do you think May considers this a justification for her actions? Did May learn anything over the course of her adventures and trials? If so, what lessons did she learn? Did you cheer or jeer at the ending? (Remember: May did say, “You and I, my new friend, will become well acquainted over the course of this tale.”) At the close of the opening chapter, May exhorts the reader to hear her out and then be the judge. What is your verdict on May and her dealings with Frank and the men in her world?